Join GLOE and the HRC's Religion & Faith Programs for this 6th annual national event that is part-ritual, part-celebration, part-feast and part-conversation! This year we say, Lo Dayeinu (It is Not Enough). In this time of so many wonderful strides for the LGBT community, we want to celebrate all the wonderful ways that our community is still working toward (and achieving!) equality, safety, and justice in our world! We’ll indulge in a delicious full (kosher for Passover) meal as we read our own Haggadah, specially created by GLOE for the occasion, and perform the festive rituals with the Jewish LGBT community and our friends. Get your tickets now—this celebration of freedom always sells out! Presented in grateful partnership with the Human Rights Campaign's Religion & Faith Program. ASL and other interpretation always gladly provided upon advance notice. *Want to attend the National Rainbow Seder for FREE? Be a volunteer! Contact GLOE at gloe@washingtondcjcc.org or 202-777-3253. I'm interested in coming, but worried because I don't know anyone. Can you help?Yes! Let us know and we'll put you in touch with a friendly GLOE person who is attending! What about dinner? Is it kosher?There is a full, delicious catered dinner at the National Rainbow Seder. As with all DCJCC events, the food we serve is kosher, as well as this meal being kosher-for-Passover. It is a milchig/dairy meal that will have both fish and vegetarian options. And of course, dessert! Is it appropriate to bring kids? Yes! The seder is not specifically a "kids" seder, but our atmosphere is casual and festive! As a group, we will be reading our haggadah and discussing the ideas around our theme, Lo Dayeinu (It is Not Enough). We welcome allwho would like to participate. To attend, do I have to be LGBTQ? Jewish? Observant? Old? Young? Ashkenazi? Sephardic? Nope. We welcome everyone who would like to join our LGBTQ seder and celebrate Passover's lessons of freedom! In fact, every year, we have a beautiful mix of people. Some are queer and Jewish, some are not. All are welcome, and (if they choose) can easily participate in a variety of ways - singing, reading, discussing ideas, or just generally being among the community. What if I don't read Hebrew? Not a problem. Much of the Seder is in English, and anything in Hebrew also appears in English transliteration. For more information, please contact GLOE Direcor, Halley Cohen at 202-777-3253 or halleyc@washingtondcjcc.org. 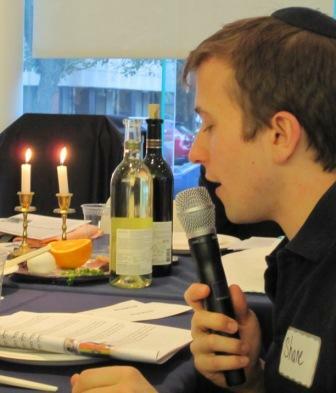 GLOE is funded in part by a grant from The Jewish Federation of Greater Washington to support Social Action Programming.